Max Sanchez is the “it” kid at Port Fare High. He’s the star of the baseball team, he’s dating head cheerleader Emma McKay, and he has a throng of wonderful, supportive friends. JD Miller is the school’s punching bag, verbally and emotionally. He has a loving mother, but her choice in boyfriends is questionable, leaving him a target at home as well as school. A tragic car accident ends it all for Max when his soul is prematurely removed from his body. The powers that be have asked him to go back to earth temporarily to help classmate JD. Max, always up for a challenge, takes it as a chance to see his beloved Emma again and quickly jumps at what he views as the easy task of helping JD. Max knows with a little cardio he can easily whip the guy into shape, ending all his troubles. While staying mentally connected to JD, Max’s soul steps into JD’s body. However, Max’s reality is shattered as he enters a world void of love and hope: JD’s world--life as the bullied kid. Will he survive? Will JD? Did Emma's love for Max die also? Will Max be able to help these Souls in Peril, or is it all as hopeless as JD believes? Wow, where do I begin with this review? Yet again author Sherry Gammon totally blew my mind with one of her books. When I read and reviewed Sherry's first novel "Unlovable" back in November of last year I was absolutely smitten with the story. I honestly never thought she would do it again with Souls in Peril and write a literary masterpiece. This is one of those books that will stick with you long after your done reading it and as I told Sherry it very well might be the BEST book I have read in 2012. The story begins where we meet a very "popular" high school kid named, Max Sanchez. He has a awesome life. A Mom and Dad who dearly love and support him. A wonderful, loving and sweet girlfriend named Emma McKay. Everything is perfect for Max and Emma. Both soon to graduate and begin their lives together. Then there's the not so lucky. A boy named JD or "Lumpy Larry", who the mean kids nickname him at school and his best friend Izzy or "Icky Izzy". They both struggle with the day in day out abuse and bulling at school and at home. At home JD deals with his Mother's abusive boyfriend. Who does everything from calling him names to psychically beats JD. Poor Izzy's home life is no better. She is being molested by her creep of a Father all the while dealing with a sickness that is slowly killing her. One night after a dinner date with Emma at Max's parents house they decided to go out for some frozen yogurt at a place nearby. Although Emma chooses to go home for the night, Max and his parents still go out. On their way home Max and his Mom and Dad get into a tragic car accident in which not one of them survive. So when Max wakes up in limbo not knowing what has happen, he finds his perfect world torn into shreds. While his parents make it into heaven, Max comes to find he shouldn't have died that night along side his parents. Gabe who is a angel explains this mishap and offers Max a deal. Gabe will grant Max a period of time to go back down to earth and fix a life for someone in desperate need with the added bonus to see Emma again. This Soul in Peril just so happens to be JD "Lumpy Larry" who Max finds out was somehow involved in the car accident as well. Max will be living in JD's body, he can think for himself as well as move for JD. His main goal is to find a way to help JD become strong, find HOPE and overcome the bullies and the beatings even if it kills him. Again! I don't want to give anymore away because I want any new readers to this story to find out what happens to Max/JD, Emma, and Izzy through the course of the book. To feel and experience what JD/Max had to deal with and fight up against. The story is so deep and there are so much more that happens than what I wrote above. 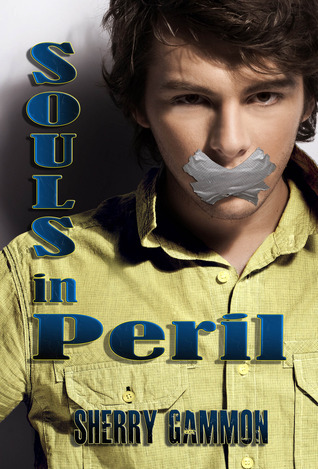 Souls in Peril touched my heart more than any book ever has. I love a book that once done reading it you feel like you can walk away lighter and uplifted. Sherry writes this story for both a bully and those who are bullied can find find hope or see the errors of their wrong ways. The story truly spoke to me and touched my soul. In The beginning of the book I was hooked, and left breathless. In the end I was blown away and left in tears. One of the many wonderful things I loved about Souls in Peril is Sherry's ability to have such an expressive writing style. The reader can sense and feel every raw emotion good or bad during the book. She made me feel like I was right there in the book living through JD. This review is also to support the "October National stop bullying month". Yes, I am a few days late, as it is now November. Thank you for reading! Wow! Awesome review Beckie. Thank you so much. I really appreciate it! I'm so sorry to hear of your past experiences, but I'm glad you didn't give up! Thank you again! This sounds like a very good book. I definitely look forward to checking it out. Thanks for the review. @ Taryn - Thank you for the comment. Yes, it is a wonderful novel.